A few years ago I happened onto the work of British poet, John Siddique—a serendipitous discovery through Facebook. Originally, I came across the name of Chris Hamilton-Emery, an accomplished poet himself and one of Salt Publishing Limited’s director’s. I recognized Salt as the publisher of friend and American poet, Jamey Dunham’s book, The Bible of Lost Pets, an insightful collection of fabulist prose poems. I know Dunham as a poet and professor at Sinclair Community College in Dayton, Ohio. His book had been selected by Salt as one of the 2008 winners of it’s Crashaw Prize for emerging poets. Chris Hamilton-Emery posted a link on Facebook to a video of some of Salt’s poets, one of which was John Siddique reading his poem “Cheap Moisturizer” and I was instantly smitten by Siddique’s work. I looked John up on Facebook and sent a message to let him know much I admired the piece. In fact, I have to admit, I was so touched by the video, I watched it several times. Beside the fact that John reads beautifully, the voice in the poem resonates. The arrangement of words, the imagery, and the careful turn near the end work together to create what can only be described as authentic realization, enlightenment that spins on the notions that we can choose how we respond to what life gives us. The poem is touching and heartfelt. and the wind dies down, and he goes off again. blowing at my chest hair. John began posting links on Facebook to animations based on a series of moon poems from Recital, “Rowan Moon”, “Ash Moon”, “Alder Moon” and others. These poems, like “Other People’s Children”, capture what it means to be human, to acknowledge and accept all that represents with a touching clarity, and on occasion, humorous wit. For instance, after the speaker lets you know in “Rowan Moon”, that Some days are over before they begin. He asks, How do you pull a sickie when you work for yourself?/You’d be paranoid about running into yourself all day. The animations are delightful and perfectly suited to the moon poems in Recital. The films were produced as a part of his British Council residency at The Center for Contemporary Poetry and Poetics at California State University, Los Angeles. The National Endowment of the Arts, the Huntington Library, and the College of Arts and Letters sponsored the residency. John gave voice to the poems while the poems were graphically interpreted by various animators and the music was specially composed by Katie Chatburn. It is well worth watching the entire series. in white window frames turned to bonewood. with its newels like old teeth—both the same. that have waited and forgotten how to wait. Over and again, Full-Blood delivers quality, moving passages such as this, in poems that affirm and stir—that do exactly what poetry is supposed to do. 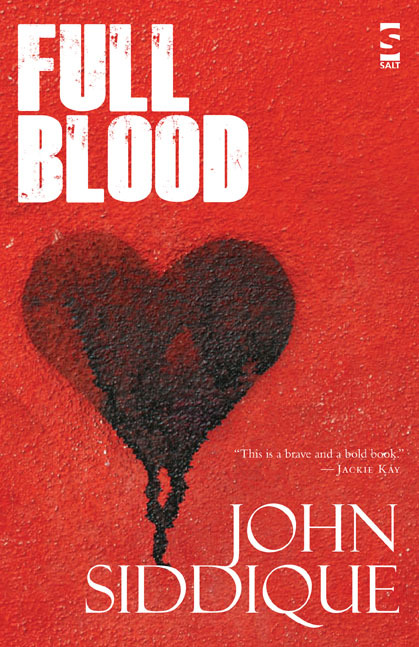 Claire Chambers is quoted on the back of Full-Blood as saying: “In this beautiful collection John Siddique seduces his reader with his life-affirming reflections on our mortality and a profoundly moving poetic interplay of tenderness, love and eroticism.” Chambers’ quote captures the power of Full-Blood exquisitely. I just can’t say it any better than that. This entry was posted in Books of poetry you should read, Poets I Really Like, Uncategorized and tagged Chris Hamilton-Emery, Full Blook, Jamey Dunham, John Siddique, Katie Chatburn, Poetry, Recital An Almanac, Salt Publishing, The Bible of Lost Pets. Bookmark the permalink. This are fantastic insights. I always love hearing about great poets whom I’ve never read before. Thank you Joey for your feedback! I think you would like John Siddique’s work. I would start with Recital and then get Full Blood. Full Blood is available for Kindle or iPad. Thank you for running the link in your blog! You are doing good work!